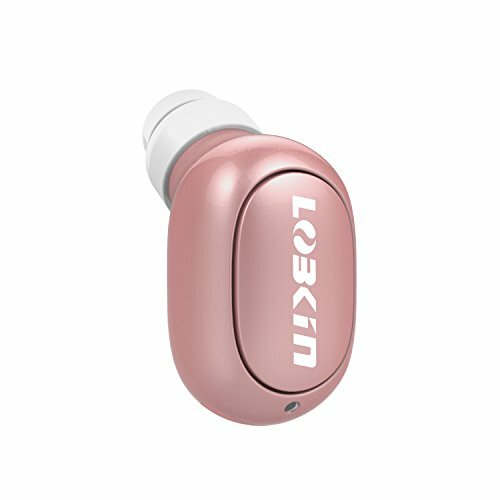 Small Earbud-Wear comfortable, hidden, suitable for a variety of scenes. Listen to your favorite tunes at work without being noticed. Comes with a carrying case to keep earbud safe when not in use. NOTE: ONLY 1 EARBUD INCLUDED, NOT A PAIR. Clear and Crisp Sound - LOBKIN earpiece pumps out big sound,ideal for listening to Audiobooks, Podcasts and Netflix, decent for music and calls. 6 Hours Play Time -Despite being so small, bluetooth earbud offers an impressive 6 hour playtime and 7 hour call time (at 40-50% volume) Fill your day with music, longest playtime among similar sized earbuds. Secure & Comfortable Fit - Ergonomic designed earbud that matches the shape of your ear canal. earbud rests gently in your ear and does not stick out. Weighing only 0.13 oz, fit feels so natural you will hardly notice it\'s there. Broad Compatibility: works with most Bluetooth enabled devices: Smartphones ( iPhone 6S/6 plus, iPhone7/plus, LG G5 G4 G3, Samsung S7) and tablets (iPad, Kindle Fire. Supports Multipoint Technology, connect 2 smartphones and answer calls from either one. One single, very small earbud that does a lot. You can listen to music or talk on the phone with it. It’s comfortable, too. Actually fits my tiny ear!